Ten percent of epistaxes are posterior, exhibiting massive bleeding that is initially bilateral. Posterior epistaxis may present in ways that suggest a more inferiorly located site of bleeding from the aerodigestive tract (eg, hemoptysis, melena, anemia, or just nausea). A posterior source of the bleeding must be sought when epistaxis is bilateral, brisk, and not controlled with anterior nasal packing. Posterior epistaxis is usually treated by an otolaryngologist, but an emergency practitioner may be called upon to treat this condition in a medical environment with few support services. Which side was bleeding initially? What is the estimated amount of blood loss? Is it in the pharynx? Has any trauma recently occurred? Are symptoms of hypovolemia present? As with any unstable patient, initial management begins by assessing the ABCs (A irway, B reathing, and C irculation). Next, the source of the bleed should be identified by a thorough examination of the nasopharynx. For more information, see Epistaxis, Management of Acute Epistaxis, and Anterior Epistaxis Nasal Pack. The nose, like the rest of the face, has an abundant blood supply. 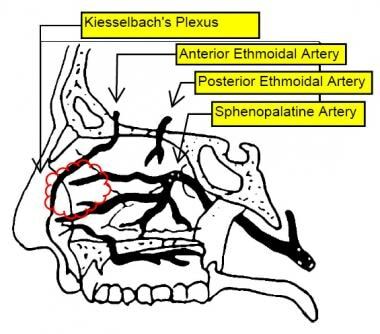 The arterial supply to the nose may be principally divided into (1) branches from the internal carotid, namely the branches of the anterior and posterior ethmoid arteries from the ophthalmic artery, and (2) branches from the external carotid, namely the sphenopalatine, greater palatine, superior labial, and angular arteries. Patient with bleeding diathesis (hereditary hemorrhagic telangiectasia,  von Willebrand disease, hemophilia, anticoagulation, antiplatelet therapy) - Each of these states makes hemostatic control much more difficult, and each has its set of additional specific targeted therapies. Temporizing measures until more definitive therapies are obtained include endoscopic ligation by an otolaryngologist or endovascular ligation by an interventional radiologist. If the patient is in shock, has altered mental status, or is otherwise not protecting the airway, the airway must be controlled before any nasal packing is attempted. Good lighting is paramount. A head lamp is optimal, but a reasonable alternative is an overhead lamp. Have the patient blow his or her nose to expel any clot. Perform a thorough anterior nasal examination to rule out an anterior bleeding source. A brisk posterior bleed may have some anterior flow but predominantly manifests with posterior oropharyngeal blood flow. See Epistaxis for more information. 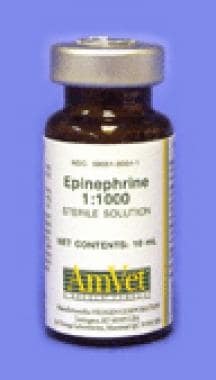 Have the patient nasally insufflate a topical vasoconstrictor, such as oxymetazoline or phenylephrine. 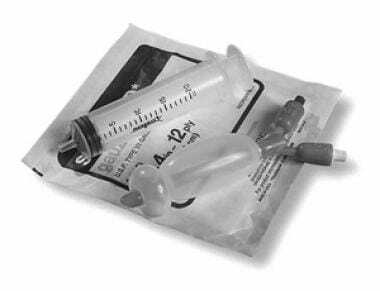 To provide anesthesia, add 2% lidocaine solution to the vasoconstrictor first, and then have the patient inhale the combination. Apply mupirocin (Bactroban) nasal ointment 2% to the double-balloon catheter, and advance the device completely into the nostril. Inflate the posterior balloon with up to 7-10 mL of sterile water. Withdraw the catheter until posterior balloon seats. The balloon stops at the posterior nasal cavity. Inflate the anterior balloon with up to 15-30 mL of sterile water. Apply padding (eg, Xeroform wrap, iodoform strips) to prevent alar necrosis. Leave the balloons in place for 3-5 days, until coagulopathy and hypertension have been controlled. Apply mupirocin nasal ointment 2% to the Foley catheter, and insert the device into the nostril. Visualize the catheter tip in the back of the throat. Inflate the balloon with up to 10 mL of sterile water. (Do not inflate the balloon to its full 30-mL capacity.) Withdraw the balloon gently until it seats posteriorly. 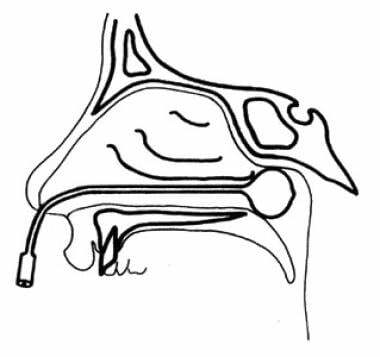 Pack the anterior nasal cavity with a balloon device, nasal tampon (eg, Rhino Rocket), or layered ribbon gauze. 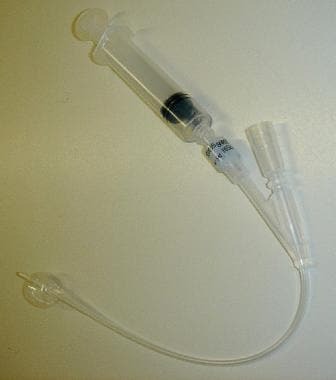 Apply a padded umbilical clamp across the catheter to prevent alar necrosis and to keep the balloon from dislodging. Posterior packing with 10F Foley catheter. 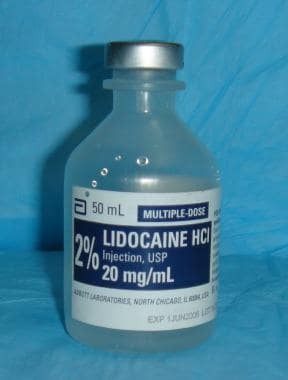 Topical anesthetics include lidocaine (2% solution) (see the image below). For more information, see Topical Anesthesia. 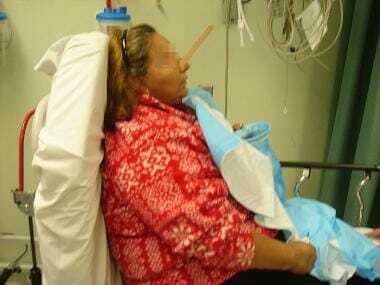 Place patient in the upright position (see the image below) unless hemodynamic instability prevents this positioning. Antibiotics may be prescribed. Agents that cover Staphylococcus species (eg, cephalexin, amoxicillin, ampicillin) can prevent sinusitis and toxic shock syndrome. Admit all patients with posterior packing to the hospital for observation. Reflex bradydysrhythmia can develop because of stimulation of the deep posterior oropharynx by the packing. Airway compromise may develop. Posterior packing should be removed in 72-96 hours. Viehweg TL, Roberson JB, Hudson JW. Epistaxis: diagnosis and treatment. J Oral Maxillofac Surg. 2006 Mar. 64(3):511-8. [Medline]. Frazee TA, Hauser MS. Nonsurgical management of epistaxis. J Oral Maxillofac Surg. 2000 Apr. 58(4):419-24. [Medline]. Schaitkin B, Strauss M, Houck JR. Epistaxis: medical versus surgical therapy: a comparison of efficacy, complications, and economic considerations. Laryngoscope. 1987 Dec. 97(12):1392-6. [Medline]. Tintinalli JE, Ruiz E, Krome RL, eds. Nasal emergencies and sinusitis. Emergency Medicine: A Comprehensive Study Guide. 4th. New York: McGraw-Hill, Health Professions Division; 1996. 1083-93. Reichman E, et al. Emergency Medicine Procedures. McGraw Hill; 2004. Leong SC, Roe RJ, Karkanevatos A. No frills management of epistaxis. Emerg Med J. 2005 Jul. 22(7):470-2. [Medline]. Chiu TW, McGarry GW. Prospective clinical study of bleeding sites in idiopathic adult posterior epistaxis. Otolaryngol Head Neck Surg. 2007 Sep. 137(3):390-3. [Medline]. Saba HI, Morelli GA, Logrono LA. Brief report: treatment of bleeding in hereditary hemorrhagic telangiectasia with aminocaproic acid. N Engl J Med. 1994 Jun 23. 330(25):1789-90. 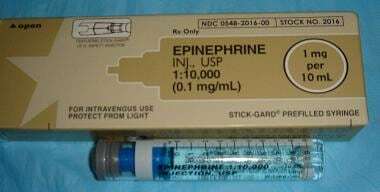 [Medline]. The authors and editors of Medscape Reference gratefully acknowledge the contributions of previous author Scott Bailey, MD, to the development and writing of the source article.